The anatomy of the earthworm provides many interesting sections. Iron bacteria form thick sheaths of iron hydroxides. These biofilms can provide a good environment for ciliates and diatoms. This interesting four part series introduces the stereo microscope and discusses its history, design, and applications. A brief history of the development of the microscope stage. Let’s do the world economic crisis all honor and have a look at some coins and bills. 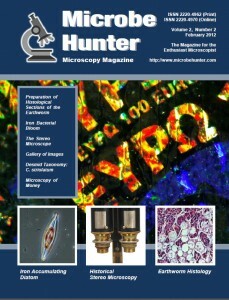 When will the February 2012 paper issue be available for shipment? Hello, I’ll get the printed issue out within a few days. I always release the printed issue a bit after the PDF to correct errors, should some appear. First; thanks for this excellent resource, and for the continuing high quality. … You are doing an amazing job! … The download appears with the filename January, not February. This is easily changed by the user, but may cause some confusion. … The confusing issue is in fact January 2012, which does not follow your standard naming convention. Majored in bacteriology (later changed to microbology) at BYU 1960. We studied real bacteriology not DNA typing or stem cell research. I was employed thirty years as a control chemist in household products and food technology.